As of this writing, Green Day has been around for an astonishing 30 years all while managing to crank out iconic hit after hit. One of their biggest is 1994’s “When I Come Around”, the fourth single off their third studio album Dookie, which was the band’s breakthrough album that catapulted them into the mainstream music scene. That’s due in no small part to the success of “When I Come Around”. The single has sold over half a million copies, which makes it the band's second best-selling single of the 1990s, only behind the 1997 hit “Good Riddance (Time of Your Life)”. Walking through the Mission District at night in chucks. The song is quintessentially 1990’s punk rock with a constant, driving guitar that only breaks for the phrase “when I come around”, and loud, crashing drums. Billie Joe Armstrong is of course on lead vocals, and his signature tone gives the song an iconic sound. Lyrically, the song is about a couple at a turning point in their relationship. The guy feels that he needs to “roam” a little more, and is suggesting that she do the same until he comes around. Making their way through San Francisco’s Powell Street BART Station. 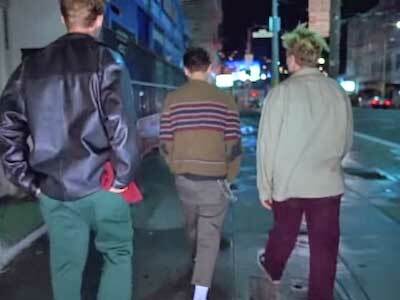 The music video features the band making their way through the streets of San Francisco’s famed Mission District, and through nearby Berkeley as scenes of everyday life are intercut around them. All three members of the band are wearing chucks. Billie Joe Armstrong is wearing a monochrome black pair, while Tre Cool and Mike Dirnt are both wearing pairs of classic black and white chucks. 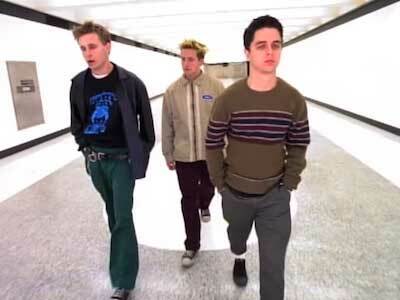 They all can be seen pretty prominently throughout Green Day’s scenes in the video, which is worth noting because of how well known this video became after release. All three band members wearing chucks. Get a new pair of chucks to stroll around town in by clicking on the links below.